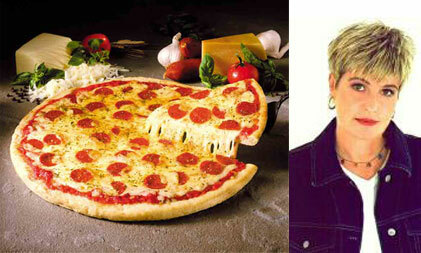 tv-ooh: tv we like to watch on the tv: EastEnders: "I want pizza and I want Hazell Dean!" EastEnders in Southend is a bit of a laugh this week, which is not something you hear very often. It's almost like a pantomime, assuming you'd get a pantomime with quite dark storylines about pimps and HIV in them. Slotted in seamlessly between musical numbers about working and whistling, maybe. It's a fact of life that misery is never far away in EastEnders, but comic relief character Heather - she's the one who wants pizza and Hazell Dean - has gone to Southend for an 80s pop concert, and other characters have gone along for the ride and to bring some misery - known as "drama", of course - and to make a week of it. Like Shirley, who clothes-wise, never left the 80s anyway - while Dot's found a sister no-one ever really knew she had, and some sort of long lost son or something. But as we say - panto. And as well as pizza, Hazell Dean, an 80s singer from the 80s who had several hits in said decade, is a recurring theme for our Heather - and Heather even did a rendition of one of Hazell Dean's hits, Searchin' - which, again, is not something you see everyday. If tv-ooh was a betting blog about television tv-ooh would bet Hazell Dean would pop up in the next episode. And, in the interests of editorial balance and such like, tv-ooh also found a pizza-related video, but it's not nearly as tunesome.